Pioneer needed a better way to manage the payroll complexities that are inherent in the energy industry. Who better than the Workday Payroll experts at Collaborative? Pioneer Energy Services (Pioneer) provides land contract drilling and production services to oil and gas exploration to both small and large companies. Founded in 1968, Pioneer is based in San Antonio and has offices across Texas and the Western US. The new millennium brought about major growth in Pioneer’s service lines, as well as their fleets of drilling rigs, well servicing rigs, and wireline and coiled tubing units. Today, Pioneer operates a modern fleet of more than 60 electric and high-end mechanical drilling rigs, 100 well servicing rigs, more than 100 cased-hole, open-hole and offshore wireline units, a range of advanced coiled tubing units and an extensive inventory of fishing and rental tools. Pioneer employs over 3,100 people whose visions align with company values of service excellence and safety first. As the company grew, Pioneer needed a better way to manage the payroll complexities that are inherent in the energy industry, such as employees relocating rigs or working on rigs outside of an employee’s actual state of residence. There were numerous payroll inconsistencies each pay period and the manual process was taxing. For Pioneer, choosing a new HRIS meant selecting the most modern, user-friendly solution to allow everyone to be better at their jobs while upholding company culture. 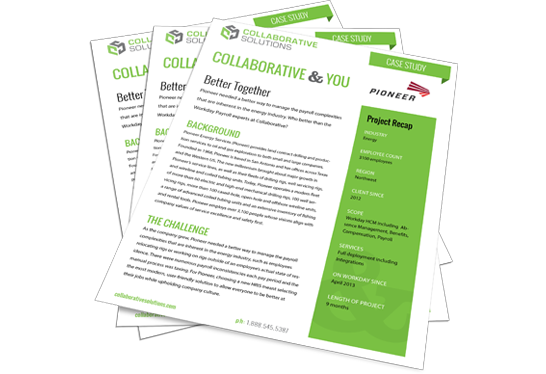 Pioneer chose Workday as their new system and selected Collaborative Solutions to deploy it. Collaborative Solutions deployed Workday Core Human Capital Management, Absence Management, Benefits, Compensation, and Payroll, and completed 16 Integrations using Cloud Connect, EIB, and Studio. Collaborative Solutions provided bonus, merit processing, and reporting assistance post go-live in 2014 and 2015. Collaborative Solutions successfully migrated Pioneer to Workday from ABRA, their legacy HR and Payroll system. Design sessions uncovered very intricate payroll complexities resulting from the nature of Pioneer’s business. However, with creativity and careful attention to detail, Pioneer’s unique payroll needs were accommodated. The first few payrolls were processed without a hitch and the staff will not miss the old way of doing things. Users like the ease with which they can conduct their jobs using Workday. Pioneer needed to better manage its unique payroll complexities. Collaborative Solutions accommodated Pioneers complex payroll needs, migrating the organization to Workday and processing its first payroll successfully.